Anyone arriving in Athens will soon catch a glimpse of the Acropolis. One of the most iconic sights in Greece, this sheer-sided hill rising high above the Athenian plain, topped by some of the most famous temples in the world, dominates the skyline both night and day. Make this your first port of call: most of Athens is visible from it, and it is a great place to orientate yourself with regard to the city – irrespective of the spectacular architecture on display! 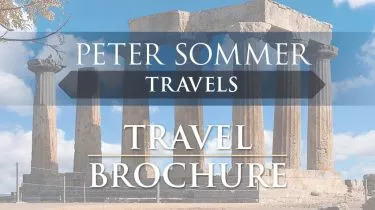 The only ticket on sale here is a joint one (€12) that includes entry to all the other major monuments of Ancient Athens (the Agora, the Roman forum, the Temple of Olympian Zeus, the Kerameikos, and the theatre of Dionysos). Although these joint tickets are also on sale at these other places, it can sometimes be difficult to explain that you want the all-inclusive ticket, rather than a ticket for that site only, making it a good idea to visit the Acropolis first. You will also benefit from one of the best initiatives taken in the run up to the Olympic celebrations in 2004 – the creation of a pedestrian route linking together all of the sites that are included in the Acropolis joint entry ticket, making the stroll between them much more pleasant than it used to be. If it is possible, time your visit here carefully: the Acropolis is the obvious destination for visitors on organised day-excursions to Athens, and can be horrendously busy for a few hours a day, while being practically deserted for the rest of the time. Early morning and late afternoon are usually the best times to go, when you will hopefully be able to appreciate the monuments and the stunning views in peace and quiet. If you have time, it is a good idea to follow the peripatos, the ancient path around the sacred rock itself, which is lined with sanctuaries and caves. For the Acropolis itself, it is advisable to bring a good guidebook or at least a decent site plan. The New Acropolis museum, opened in 2009, is located just below (easily visible from the Acropolis) and the entry fee is €5. It contains a wealth of finds from the Acropolis, including wonderful Archaic sculpture, some of which still has traces of the original paint! Located just to the northwest of the Acropolis is the Agora, literally the market, but really the commercial, civic, political, judicial and ceremonial centre of the ancient city. The site is large and very beautiful, and full of architectural remains directly connected with the city’s great history. The most impressive is the Temple of Hepahistos, nearly fully preserved. Again a good guidebook helps to understand this site, as does a visit to the excellent site museum, housed in the fully reconstructed 3rd century BC Stoa of Attalus. Not far from here are the Hill of the Nymphs and of Philopappus, the latter crowned by a crumbling Roman grave monument. Both offer panoramic views of the Acropolis. The area to the north of the Acropolis, Plaka, is the oldest district in Athens, occupying the same area that was the site of old the town of Athens which preceded its reinvention and redesign as the capital of independent Greece. It contains many fine cafes and restaurants – among the best are Psarras and Vyzantino (corner of Erechtheous and Erotokritou, and 18 Kydatheneon Street, respectively). Beware, though: it can be easy to get lost in the winding streets of Plaka, so get hold of a map of central Athens if you are going to do any serious walking. Free copies are easily obtained from most hotels and information points, or they can be purchased relatively cheaply in advance. Plaka is in many ways the heart of Athens. It contains many of the major archaeological sites, as well as some of the oldest churches, and is roughly central to the rest. It’s here that you’ll find the greatest concentration of traditional Greek architecture. It can be quite a hike up and down the slopes, but it is well worth the trip to the higher reaches to get away from the crowds that throng the lower parts, and see a little of what Athens used to be like in the 19th century. The topmost reaches of Plaka, just below the northeast flank of the Acropolis, contain the settlement of Anafiotika, built in the 19th century by immigrants from the Cycladic islands in the style of an island village. This is one of the most unusual and most beautiful parts of Athens, hidden away in the city’s very heart. All of the other sites included in the Acropolis entry ticket are well worth visiting. For a nice morning or afternoon outing, combine the outliers – the Kerameikos and Temple of Zeus – with other sites. For an interesting route to the Kerameikos, try beginning at Plateia Monistaraki and the Tzistarakis mosque (stopping at its small pottery museum), and then head through the flea market until you reach Odhos Ermou. The central drag of the market is not particularly inspiring, but many of the shops in the side-streets are worth exploring. A little way down Ermou, on the right just before the Kerameikos, is a street called Melidhoni. Here, there’s another pottery museum and the chance to see pottery being made in time-honoured fashion. Melidhoni is crossed at the end by another road called Asomaton, with its museum of Islamic art. The old Jewish synagogue of Athens is also in this area, although it can often only be viewed from outside. The Kerameikos itself was the main cemetery of the ancient city. The site is a picturesque, nearly park-like and includes an interesting site museum. The Temple of Zeus is best reached by a looping route from the centre of Plaka around the Acropolis to the Lysikrates monument near the junction of Odhos Tripodhon and Epimenidhou. This was originally a monument set up by a playwright who had won a dramatic competition in 4th century BC Athens, but it became part of a Capuchin convent and Byron allegedly wrote part of Childe Harold in its hollowed out core. From here, you can cross Leoforos Vassilis Amalias and enter the Temple of Zeus after taking in Hadrian’s arch, set up by a previous admirer of Athens. You can finish the walk here, but if you’ve been bitten by the bug, it’s well worth continuing to the end of Vasilissis Olgas. Cross the road – with care, it’s busy! – to the Panathenaic stadium or Kallimarmaro, built in the late 19th century on the remains of an ancient stadium to host the newly resumed Olympic games. It was used again for the 2004 Olympics, and is simply one of the most amazing spectacles in the city – and one which almost no-one ever visits. From here, you can return to the centre via the National gardens, or enter into the outskirts of another district, Pangrati, to eat in one of the local restaurants – Theophilos on Plataia Proskopon being one of the very best. If you decide to visit either the Benaki or Goulandris museums (see below), then you have travelled to another interesting district of Athens, Kolonaki, which is quite different to Plaka. It is relatively new, so contains little that is interesting in the way of architecture, but it is the wealthiest district in the centre of Athens, and is therefore a great place to people-watch. The Greeks say that Athens is simply the biggest village in the land, but it would be more correct to say that it is a collection of villages, each of which forms a district with its own centre, the main square (Plateia). Sit in one of the cafes in Plateia Kolonaki, order a drink, and watch the rich and powerful drift by. If you happen to come here for a pre-dinner drink, one of the best places to eat is Dhimokritos (Dhimokritou 23). The Lykavitos hill rises high above Kolonaki, and provides a good way to either work up an appetite, or work off some recently acquired calories. The less-turbocharged may prefer to walk up through the (still steep) streets of Kolonaki to the Funicular which runs up to the top, but those with energy will want to walk all the way, on a tended path that runs through woodland: a rare commodity in the city centre! The summit is topped by a beautiful little Cycladic-style church, and the views from here are simply spectacular. Another sight worth seeing occurs at regular intervals throughout the day: the changing of the guard at the tomb of the Unknown Soldier in front of the parliament building in Plateia Syntagma. The soldiers are from an elite regiment, the Evzones, and they wear a traditional costume from the Northern mountain districts and goose-step their way slowly around a path to and from their allotted position. The square itself is nondescript, except during Christmas time when it sports an enormous Christmas tree, but some of the roads that radiate from it are well worth exploring. In particular, Panepistimiou and its side-streets are a great place to go shopping, not least because the flagship Eleftheroudakis bookstore is located here (at n.15): a multi-storey shop filled with all the best guidebooks, novels, maps etc. that you could wish for (many in English). If shopping is not for you, then this road also houses the excellent Numismatic Museum (no.12) in Heinrich Schliemann’s old Mansion – it is worth paying a visit just to see the house of this pioneering and controversial archaeologist, never mind the huge collection of coins! Once again, there are some good restaurants in easy reach. Ideal (no.46 Panepistimiou) is perhaps the best in terms of atmosphere and good, traditional cooking. There are many more areas to explore in the centre. The following are worthy of note. Ano Petralona is the area west of the Acropolis. In the evening it is busy with packed cafés and bars along the edge of the Agora, but if you find your way further inside and to Odos Troon, you have access to a whole array of excellent restaurant options. Koukaki, behind the New Acropolis Museum, is a lovely and quiet area with some great Neoclassical houses, some good small hotels and a few good restaurants. Gyzi, to the northwest of Monastiraki, is another lively area of mainly bars and restaurants, very popular with the younger Athenians. Even livelier is Exarcheia, the student (and anarchist) quarter near the National Museum. Especially Odos Benaki has very interesting food options to offer. The main museum of the city, the National Archaeological Museum, houses the greatest treasure trove of Ancient Greek artefacts in the world, including the finds from the princely graves of Mycenae, the Cycladic frescoes from Thera, the Pompeii of the Aegean, and a vast collection of Classical and Roman sculpture. The museum is a little out of the way, and is probably the only major monument in the city worth getting public transport to. A full visit takes a minimum of two hours; for the museum aficionado, even a day may not be enough. Kolonaki (see above) houses two museums of great interest. The first of these is the Goulandris Museum of Cycladic Art, with a large exhibition of Cycladic idols, those highly stylised marble figurines from the 3rd millennium BC that have become iconic of prehistoric art. The other is the Benaki Museum, an utterly fascinating and highly varied collection of Greek art from antiquity to present, including ancient jewellery, Byzantine icons, 18th and 19th century traditional costumes, furnishings and interiors, and much much more. Both Kolonaki museums have excellent gift shops and good cafés/restaurants, the Benaki’s in an especially splendid setting. There are many other museums to explore in the city and its outskirts, so if you have time, go and discover. For example, the archaeological museum in Piraeus, the harbour town of Athens, is well worth a visit. By now, you might be pretty weary. Fortunately there are cafés and bars dotted all over town, and the ubiquitous periptero, which is a kind of corner shop stocking cold drinks, ice creams, newspapers, cigarettes, etc. actually on the street corner itself. Most are small wooden huts, in which the owner sits and takes money, serving goods through the windows, but some have become quite lavish affairs, taking up a lot of the street. They are excellent information points, and a nice demonstration of how safe this city truly is: so much of the produce is on the outside, far from the reach or sight of the proprietor, that shoplifters, if they existed in any number, could rob them blind. In recent years, Athens has developed an interesting and lively new scene of designated wine bars, dedicated to the presentation and enjoyment of the “New Wines of Greece”, the highly convincing and competitive results of the ongoing reorganisation of the country’s wine production. It is worth finding out whether such a place exists in your vicinity. If you have time to spare, there are a number of easy excursions or day trips within Attica that can be taken from the city centre. The most popular is that to the Temple of Poseidon at Cape Sounion, a beautifully preserved classical edifice at the very tip of the Attic peninsula. Another good option is a trip to the nearby island of Aigina (from Piraeus) with its lovely island town (eat fish here) and the great Temple of Artemis Aphaia overlooking the Saronic Gulf. If you have your own transport, you could also explore the great museum at Brauron/Vravrona near the airport (the best presented archaeological collection in provincial Attica), the unspoilt ancient city of Rhamnous near Marathon in Northern Attica, or the Classical and Hellenistic fortifications that line Attica’s western and northern borders. We took the road less traveled and that made all the difference. The PST tour Exploring the Peloponnese, truly did explore. Most advertised tours don't include the wild Mani area,and don't include mountain bus trips through Central Arcadia, or a boat trip through a flooded magical cave where we were like visitors to Hades. We discovered Greek wild-flowers, and Greek wine, local Greek food-dishes (including wild boar). We stayed in delightful and unusual small hotels and visited all the usual sites such as Mycenae, and Olympia but with tour leaders, archaelogists Heinrich and Nota, fallen heaps of stones and massed museum displays came alive as buildings and lifestyles, and the history, icons, and wall paintings of Byzantine churches were explained to a group of travellers much more familiar with western art. They opened up a world that all the studying from books cannot give. The only trouble is "I want to go back for more"! A wonderful trip.